Plot; Toxic Ashes goes for a quiet walk at night, his companion sleeping in a makeshift den, and just so happens to bump into others along the way. Who is king? ; Bolt is of course. Best king ever. Plot:walks over to makeshifts den and introduces myself. "Hi my name is ScarletDemon." "I was just exploring my new territory and happened to find you guys." "I also kept on getting lost along the way but now that we have met maybe you guys can show mw around." Toxic padded silently through the forest, blending in almost completely if it weren't for his bright green markings. He had only just started his walk, being only a few feet from the makeshift den he and his lioness companion, Zila, had made. It was not an official den, but it was something to keep them warm. A voice made Toxic pause, and when he looked back he let out a quiet growl. It seemed to be a white pelted female with a scar across her eye. He listens to her speak, glancing over at the sleeping form of Zila before looking back to the female who said to be named ScarletDemon. "Your new, huh? To the pack?" He asked with narrowed eyes, stepping closer to the female. "I was going for a walk. You can join me if you wish, just don't be loud." He said, the end of his sentence pucuated with a growl. Notes: Gotta add Addressed and Mentioned at the end of your posts. "Alright I will join you guys only because im new and seem to be lost." 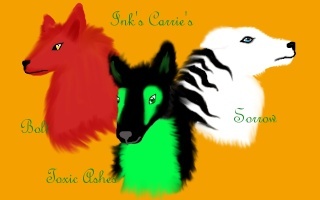 ScarletDemon joined Toxic and zila in their soon to be wild adventure. "Hey Toxic you hear that?" Toxic merely grunted in reply before turning to start to walk away from the den. He didn't know why he was being so nice. Probably because he was tired, or maybe it was because it was late at night. Whatever the reason, he was still acting tame, which was most likely a good thing for the new comer. He paused at the new comer's words, ears perking forward to try to see what the she-wolf had heard but the only thing that he heard was the dull silence of the night. "No, I didn't hear anything." He said, turning to look at ScarletDemon curiously. Notes: Tox is being so niiiiiiiiice. "I could if sworn that I heard something. " Anyways what are you doing creeping around at night?" Toxic huffs in slight annoyance before turning back to start walking again. He listened to ScarletDemon's question, feeling slightly amused at her choice of words. He repeated, eyebrow raised, features carrying a twisted grin, for he couldn't smile nicely, it was against his nature. "I couldn't sleep, and I had thought a walk through the forest would help." He said, just as the sound of running water reached his ears. He picked up his pace, his walk turning into a brisk trot, and soon he reached the slow flowing river. He lapped at the water for a few moments before turning back towards ScarletDemon, presuming the female had followed, and began to speak his own question. "So, where did you come from?" 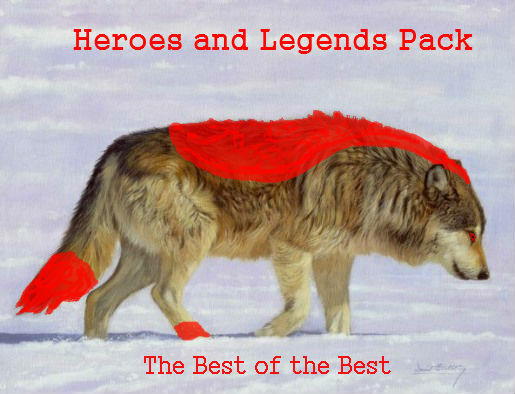 "You see it all started with my old pack." ScarletDemon looks at her reflection in the river. "Its a long story I would prefer not talking about it." "Thats why I decided to travel about in this new wonderful place." ScarletDemon then tries to force a smile. Toxic Ashes' snorts quietly in bitter amusement when the female finished with the line "wonderful new place". To him, this place was filled with just as much evil and hatred as the rest of the world, yet it was a place where he fit in. It was his place of beautifully dangerous hatred and evil. So he then only nodded in agreement, studying his reflection in the water. After a few moments of silence he spoke. "My name is Toxic Ashes, by the way. Most call me Toxic, though." He didn't know why he said it, it was a rather tame thing, to swap such a valuable piece of information. He shook the thoughts from his mind, once again focusing on his reflection in the river. ScarletDemon sees Toxics reflection whilst looking at her own. "Our pack was very bloodthirsty/strong and all the other packs were the total oppisite. Until one night my parents got taken by the "Insanity wolves" ever since I was a pup. Till then I have survived on my own. And this scar on my eye was from one of the "insanity wolves." Toxic listened to the female as she told her story, face void of emotion. Insanity wolves? Sounded like a nasty bunch, if he was honest. Though, he was also one of the darker wolves in the world, so he shouldn't be talking. He remained silent for a few moments before he began speaking, thinking over his words carefully. "Sounds like a hard life." He commented, eyes focused on the water, a flash of movement catching his attention. When he saw it again he lunged, fangs flashing as he snapped his jaws, losing his footing and falling into the river. Toxic managed to get a grip on the thing he was on and surfaced, scrambling out of the water and onto the shore, he released the now dead fish and let it drop to the ground, breathing hard, water dripping from his pelt to the ground. "Nice catch. Ya know ur one of the nicest wolves I have ever met. Now ur side of the story. Where are you from?" Toxic's body shook with uncontrollable laugher, dark and bitter. Nicest wolf she ever met? Oh how untrue that was... Or maybe it wasn't. Maybe this wolf had been only around wolves darker then himself, or just himself at the moment. Once his laughter died down he began answering the wolf. "I wasn't born into a pack, my dad died before I was born, so it was only me and my mom, well, me, my mom and Zila." "I had a pretty normal puphood, till my mom died from radiation and I developed these unusual marks and a... power, of sorts. I have been traveling ever since then." He said, unsure why he was sharing his history with a wolf he had only met. He stared down at the fish, finding that he wasn't that hungry, and made a rather strange decision that wasn't like him at all. He nudged the fish towards ScarletDemon, giving it away. He was definitely going soft, or maybe he was just going soft for this wolf? He didn't know. Notes: Hey Scar, could you mind not using chat speak (ur) and maybe adding a bit more detail to your posts? Thanks. "Are you a time traveling wolf and what kind of power?" ScarletDemon then sniffed the air for which it smelt like another pack. Uh-oh...."They found me!!!" "But how?" ScarletDemon then saw what she never wanted to see. Toxic raised an eyebrow at ScarletDemon when she asked if he was a time traveling wolf, then asked of his power. "No... I cannot travel through time. Yet I can control radiation, and I believe that is a much better power then time travel." He replied, slowly at first, before he returned to normal speaking speed. Seeing that the female didn't take the fish he shrugged, grabbing it and quickly gulping it down. He may not have been hungry, but it was useless to let something go to waste. His ears perked forward and he bristled at the female's words, looking around. He sniffed the air yet couldn't smell anything out of the ordinary. He said, green eyes scanning his surroundings. Nothing seemed out of the ordinary to him, it was still silent, no shapes could be spotted in the darkness, nor could he smell anything. Toxic Ashes shot Scarlet a confused look. "I think you might need to sleep." He said after a few moments, turning towards the den. He felt strangely concerned for this wolf that he had only just met. Notes; I don't think your allowed to rp another pack coming into the territory. Ask the nature account. "Whats wrong Tox. You ok? I mean I dont think I need sleep. After what just happened before I came here. The real reason why I came here was because I couldnt find anywhere to stay. I found some humans but then I remembered that my mother told me to stay away from humans.So then I traveled week after week looking for somewhere to stay so I found this place and ran into you."